We are German Shepherd breeders in Alberta, family run, located west of Sylvan Lake, Alberta. We produce superb World Champion European working line and show line red and black, long and short coat puppies and adults, with excellent temperaments, great drive, pronounced retrieval instincts, vibrant markings and intelligence that is true to the German Shepherd. Janzhaus German shepherd breeding lines are hand selected from proven imported Czechoslovakian and German pedigrees, to produce the finest quality of German Shepherd pups. Our German Shepherd dogs are sociable with sturdy structures, agile, calmly confident and with sound stature, even temperaments and strong nerves. Show line German Shepherd puppies make the best all around family pet. We offer working line for SAR, protection, detection and sport dogs. Extremely smart and quick learners, these traits have been passed on in their pedigrees of proven champions. We are proud of our German Shepherd puppies and would love to be able to keep all of our babies, however, finding great homes for them makes it a little easier to say "GOODBYE". Our German Shepherd pups have plenty of space to run and play and are exercised daily, as well as being socialized with our other dogs, and children. They have plenty of fun swimming in our babbling creek, chasing the butterflies and harmonizing with the coyotes. A recommended raw food diet for you to follow for optimal health is supplied. Recommended vaccination protocol is suggested for your pup. 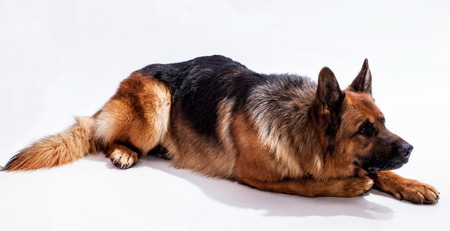 Top trainers in the German Shepherd community are provided for our new dog owners. As breeders of our German Shepherds dogs, our commitment for lifelong support for you and your German Shepherd puppy is always available. The "Proof is in the Pup"